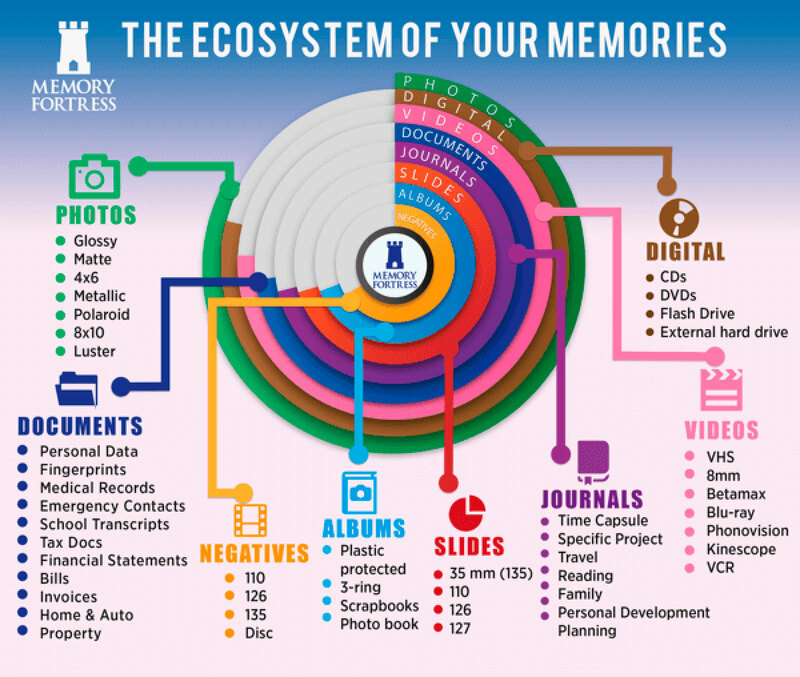 Memory Fortress was founded with one mission in mind: To give customers a fast low price solution to the problem of maintaining and viewing analog memories in a digital age. Like everyone else, the founders had thousands of old photos in shoeboxes and photo albums, hundreds of hours of VHS and 8mm videotape in cardboard boxes, and slide carousels stacked to the ceiling of our closets. All were valuable memories, but few were easily accessible, much less viewable. And none of them were well organized. Trying to find a particular memory had proven to be nearly impossible. Analog media deteriorates every day. Pictures and videos and slides from the past do not maintain the same quality they had when they were first created. 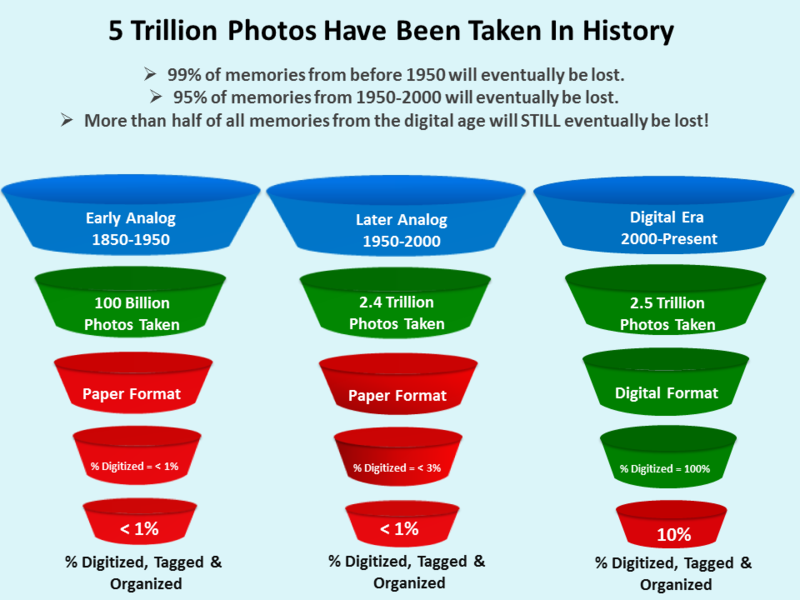 By some estimates, there about five trillion analog photographs, and nearly all of them will slowly fade to oblivion. We want to stop this senseless loss of priceless memories before more people are lost to the dustbin of history. Starting in 2009, we scanned tens of thousands of photographs for ourselves and for our friends before realizing there had to be a better way. We looked at existing services around the country, and even used some of them ourselves. Most did a decent job, but we quickly realized that most customers would not be able to pay the higher prices these companies require. Moreover, the turnaround times were slow – no company could turn around even a small order in under 10 days, and some took over a month. That was a major problem for the tens of millions of people who simply wanted their pictures to be scanned and organized quickly and cheaply. We quickly realized there was a huge opportunity to help all Americans, not just a few. So we launched Memory Fortress. Our years of taking care of valued customers mean that you will receive an email during each and every step of the process. From initial receipt of your memories at our facility, to the scanning, organizing, transferring to your preferred digital format and ultimately shipping out to you all in less than one week. In addition to keeping you up to date to where your memories are in the process, one of our founders will personally call you to thank you and to make sure you are completely satisfied. We believe that it is our duty to preserve our own memories, as well as the memories of those who came before us. It is not acceptable to let time wash away memories from the past, not with the digital technology available today. We are passionate about ensuring that all memories are digitized and properly tagged so that searching for that special image will take less than five seconds. We hold ourselves to high standards, and want to make it incredibly easy and inexpensive for you to make your old memories come alive once again.